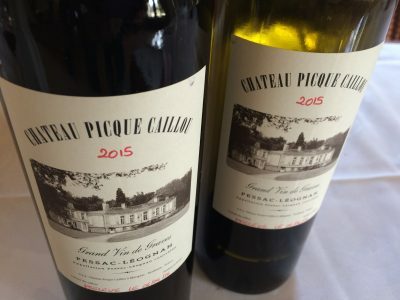 Good well made wines here at Pique Caillou. They represent good value for money, white and red. The property is run by Paulin and Isabelle Calvet. Vineyards/Terroir: 21 hectares on poor sandy gravel planted with equal proportions of Cabernet and Merlot [45%] and 10% Cabernet Franc for the reds and 60% Sauvignon Blanc and 40% Sémillon for the whites. Winemaking/Elévage: 12 months in barrel for reds, one third new, 8 months for whites, 20% new. 2012 Pale straw; gunflint and apple notes; simple palate which maybe lacks a little acid? Drink now-2018. 85 UGC Oct ’14 [Earlier note] Pale straw; some wax and wet dog; quite full initially if lacks a bit of zip. OK 85-87 Tasted Monday April 8, 2013 at Chateau Olivier. 2010 Pale green/gold; some honey, a little passion fruit and wet wool; quite taut style on the palate and focused on the fruit. Nice palate, clean and fruit driven without being worked too much. I like this. Will fill out too. 88+ [Earlier] Pale straw; leesy, quite fresh, some wax; nice palate, candy and wax promising and a good value option I’d have thought; nice roundness and good zip. Excellent and very well made. Very good length. 90-92+/100 Tasted 6 April 2011 UGC. 2010 Deep and concentrated looking; more leaf and lift; mid-weight, earthy with some blackcurrant; very good effort; lots of blackcurrants; plump with lots of fruit; very easy. Sufficient chew and grip to keep the interest – enjoyable. Great effort from this estate that makes well made wines of typicity at an affordable price. [50% Merlot, 50% Cabernet Sauvignon] 90 [Earlier] Deep and saturated; fresh mineral note; crushed rocks and pleasing purity here; refreshing Cabernet influence – quite unadorned but none the worse for it; real blackcurrant fruit; sweet and ripe palate, good attack and nicely balanced; has extract but also depth. Tannic finish. Should be good and good value 88-90+/100 [55% Cabernet Sauvignon, 45% Merlot 13.5-14 alc] Tasted 6 April 2011 UGC. 2009 Rouge Dense and deep; glossy; blackcurrants, minerals, strong nose; feels quite fresh with some cream at the edge; ripe palate, mineral tones; depth and chew; tannin a bit coarse but should settle. Not bad effort. 88+/100 [Earlier] Good density of colour; fresh; fresh fruit nose with earthy undertow; ripe and sturdy with layers; some prettiness here; palate spicy and briary notes; red fruits; concentration with tannin and acid; good mouthful with grip at the end. Grippy and very good. Should be good value. 88-90/100. Tasted 31st March 2010.